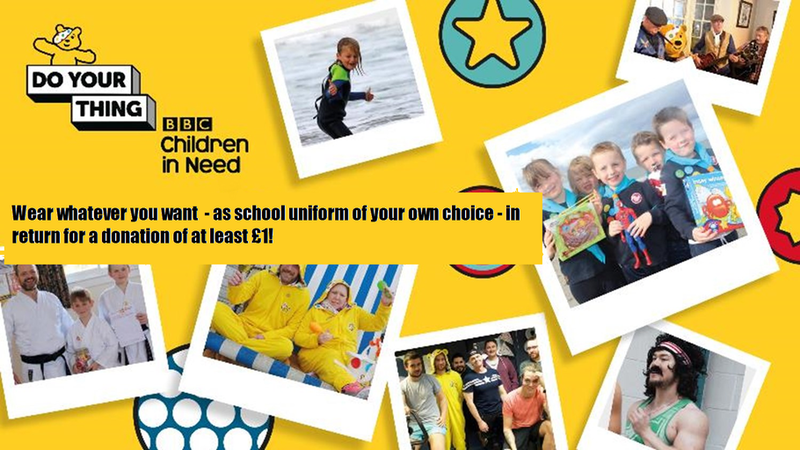 To support Children in Need, we are encouraging everyone to "do their thing" this Friday by coming to school in their dream school uniform. Everyone can wear what they want (keeping it safe to wear and appropriate for the weather conditions) as school uniform for the day. In return, we ask that a donation is made to Children in Need. This year - in order that Children in Need gets as much money as possible - we are asking that taxpaying parents/carers donate directly to Children in Need using this link: https://mydonatetelethonsappeals.bt.com/donate/cin2018/ - this allows the charity to claim an extra 25% in Gift Aid. Children may still contribute in school and can bring in any donation they want - as long as it is a minimum of £1 and not in loose change (50p or £1 coins only please).